Update December 9, 2016: PewDiePie, that notorious YouTube jokester, has trolled the entire internet and, quite possibly, the world, by deleting his second channel instead of his main one after reaching 50 million subscribers. We fell for it, along with a bunch of other media outlets, as you can see in the video above. It could have perhaps been PewDiePie’s way of getting back at the media, after a few outliers published negative stories about the YouTube star recently. Or perhaps it was a push before a charity stream that was happening today. Record yourself screaming to our list of the best zombie games. Or, you know, he could have just wanted to break that 50 million milestone even faster, netting him a bunch more viewers, therefore more cash, and also making him the first person to do so. He might even get a lump of glass from YouTube to commemorate the occasion. I bet it’s real glass too, not perspex. Update December 8, 2016:PewDiePie’s channel finally hit 50 million subscribers tonight, so he’s celebrating this achievement by deleting his channel tomorrow and starting again. To be fair, PewDiePie has completed YouTube now. It’s over. Where do you go after 50 million anyway? He has enough money, and it’s not like all of his cash comes from YouTube these days anyway. We all like to chase some kind of high, and maybe he just doesn’t get the same buzz out of YouTube now it’s an endless wave of identical comments. Of course, this decision was originally made in reaction to some YouTube changes in regards to promoted content, which you can read about in the original story below, or watch the man himself talk about in the video above. He revealed the timing of the channel deletion in a tweet. Now everyone is just waiting to see if he goes through with it. He kind of has to now, though, as otherwise people will think he did it for the subscribers. Not that it’d be the worst thing people have said about the YouTube star, with some outlets recently reporting that he was a racist because he made a joke about being white. Original Story December 6, 2016: YouTube’s biggest star, Felix Kjellberg, aka PewDiePie, has threatened to delete his channel and start again when it gets to 50 million subscribers, apparently in reaction to some subtle changes on the video hosting site. He’s not alone, either – many prominent content creators are speaking out, includingH3H3Productions. The reason for this outcry is because YouTube are apparently prioritising clickbait videos over things people are subscribed to, making them more visible than the videos people have signed up for. Subscribers are also seemingly dropping off, with PewDiePie noting a significant decrease in viewer numbers. Apparently all it takes to get your videos promoted now isa clickable thumbnail and title. YouTube will push this content to the top, regardless of video quality. 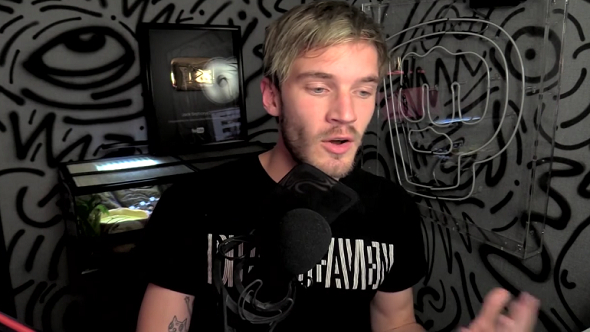 PewDiePie made an estimated $15 million from his channel last year, so he can certainly afford to, but it’s not the first time he’s said something just to mess with his fanbase. However, since the video aired he’s been in touch with YouTube. Talking to YouTube about what the issue is with their site lately. Holding pitch forks and tourches off for now. Whether anything comes from that conversation is a different matter, as YouTube have provided a statement to The Mirror since suggesting that all is well. “Some creators have expressed concerns around a drop in their subscriber numbers,” YouTube explain. “We’ve done an extensive review and found there have been no decreases in creators subscriber numbers beyond what normally happens when viewers either unsubscribe from a creator’s channel or when YouTube removes spammed subscribers.